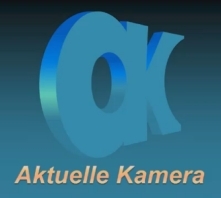 Aktuelle Kamera logo from 1987 to 1990. Aktuelle Kamera ("Current Camera"; aktuell does not mean actual) was the flagship television newscast of Deutscher Fernsehfunk, the state television broadcaster of the German Democratic Republic (East Germany) (known as Fernsehen der DDR from 11 February 1972 to 11 March 1990). On air from 21 December 1952 (daily broadcasts did not take place until 11 October 1957) to 14 December 1990, Aktuelle Kamera was one of the main propaganda tools of the East German government. Originally, Aktuelle Kamera was (at least by Eastern Bloc standards) fairly critical of the ruling Socialist Unity Party. This was because television was not considered part of the mass media at the time due to its limited reach. However, this changed when the television service reported accurately on the uprising in East Berlin on 17 June 1953. In the repression following the uprising, DF's director was sacked. Afterwards, DF/DDR-FS's newsroom was directly linked to the SED Politburo, and Aktuelle Kamera took on a similar look to its radio and newspaper counterparts. For most of the next 37 years, it had a marked pro-government bias and typically did not report on news that could potentially fuel anti-government sentiment. With few exceptions, stories promoted socialism and portrayed the West in a negative manner. Aktuelle Kamera's main edition was originally scheduled at 20:00 before being moved to 19:30 in the 1960s, so as not to coincide with the major West German newscasts, ZDF's heute at 19:00 and the ARD's Tagesschau at 20:00, both of which were widely watched in East Germany. The broadcast lasted 20 minutes until 1972 when it was expanded to a full half-hour. Aktuelle Kamera newscast as seen on a Rembrandt television set, made in East Germany in the 1950s-1960s. Starting in the mid-1970s, another 30-minute edition was presented on DDR2 (launched in 1969) around 21:30. Prior to that, both channels aired Aktuelle Kamera simultaneously at 19:30, then repeated the next morning when DDR1 signed on around 9:30 (later 8:30), before airing school-oriented programming, co-produced by the DDR-FS and the GDR Education Ministry. News summaries were added as the transmissions increased during the day. There was a bulletin at the end of the morning programmes (i.e. between 12:00 and 13:00) and another, the afternoon news update, at 17:00 on DDR1. DDR2's evening schedule always began with the news at 18:45 (later 17:45 and 18:55). Late newscasts didn't appear until the 1970s, when DDR1 screened a headline update following the magazine programmes, around 22:00. From the 1980s, Aktuelle Kamera's final round-up was the last scheduled programme at the end of the day. In fact, television audiences largely ignored Aktuelle Kamera, preferring to watch West German newscasts, like the ARD's Tagesschau. The East German authorities adopted the French colour standard SECAM rather than the PAL encoding used in the Federal Republic of Germany. The basic television standard remained the same. It did prevent reception in colour by native East German television sets though the majority of them were monochrome (black and white) anyway. East Germans responded by buying PAL decoders for their SECAM television sets. Eventually the government in East Berlin stopped paying attention to so-called Republikflucht via Fernsehen, or "defection via television" and from 1977 onwards permitted the sale of dual standard (PAL/SECAM) sets; the SECAM standard stopped being used in East Germany after reunification, instead using PAL as it had been in the West. Aktuelle Kamera served as an example for the Estonian newscast Aktuaalne Kaamera that was first aired in Eesti Televisioon on 11 March 1956. Aktuaalne Kaamera, even after several changes in format and Estonia becoming independent, still airs as a daily newscast there today. Starting in October 1989 almost a month before the fall of the Berlin Wall (9 November), Aktuelle Kamera loosened its fidelity to the party line and began presenting fair reports about the events transforming East Germany at the time. On 16 October, it showed its first pictures of the massive opposition rallies taking place every Monday in Leipzig. Within two days of its historic coverage of the Monday demonstrations in East Germany, AK broadcast highlights of the dramatic October SED plenum that saw the mass removal of the party leadership and of several members of its Central Committee. On 30 October 1989, Aktuelle Kamera on DDR2 was rebranded as AK Zwo. Three months later, long after the Berlin Wall fell but before German reunification, AK Zwo's theme and graphics were carried over to Aktuelle Kamera versions on the DFF1 (the former DDR1) on 12 March 1990. The 12:50 newscast was from then known as AK am Mittag ("CC at Midday") and the main broadcast at 19:30 became AK am Abend ("CC Evening"). News summaries received the generic name of AK-Nachrichten (simply "CC-News") or AK-Kurznachrichten. The 1990 editions featured highlights of the events on the eve of national reunification (2–3 October) and on the day itself. The last AK am Abend was anchored by Wolfgang Meyer on 14 December 1990 at 19:30, while the last newscast as Aktuelle Kamera was anchored by Petra Kusch-Lück at 1:00 on DFF1. The following day, DFF's newscasts were re-titled Aktuell ("Current"). East German television was reduced to one channel, after DFF1 folded, its transmitters becoming part of the Erstes Deutsches Fernsehen (now Das Erste) network. On 1 January 1992 at 0:00 (midnight), the former DFF2 was regionalised and incorporated into the ARD as the regional channel ("Dritte Programme" - "Third programme") for the "New Länder" under the names of Mitteldeutscher Rundfunk Fernsehen (Saxony, Saxony-Anhalt, Thuringia), ORB-Fernsehen (Brandenburg, later merged with Sender Freies Berlin to form Rundfunk Berlin-Brandenburg on 1 May 2003) and N3 (Mecklenburg-Vorpommern). The 2003 film Good Bye, Lenin!, about a woman who falls into a coma before the Berlin Wall comes down and doesn't emerge until several months hence, features Aktuelle Kamera as a plot point. The film deals with how her children create a "DDR in her bedroom", doing such things as putting food in old jars, wearing old clothes—and showing AK tapes heavily. One of the first things protagonist Alex's friend Denis does is get tapes of old East German shows: "about 30 Aktuelle Kamera, 11 Der schwarze Kanal, six of Ein Kessel Buntes (shown in subtitles as "that variety show you mentioned"), and three or four of Everyday Life in the West." When Alex said that his mother would notice that the news was old, his friend replied that "they're all the same old crap, anyway." Denis, an amateur filmmaker, even goes as far to produce fake newscasts that say that West Germans were streaming into the DDR to avoid neo-Nazi groups and unemployment, not the other way round. ^ Patterson, Sue. "LibGuides: VCE English: Stasiland Study Guide: Chapters 2-14". libguides.marymede.vic.edu.au. ^ "TV in the GDR - Screening Socialism - Loughborough University". www.lboro.ac.uk. ^ "DRA: Sendereihen des DDR-Fernsehens". 1989.dra.de. This page was last edited on 13 January 2019, at 02:16 (UTC).